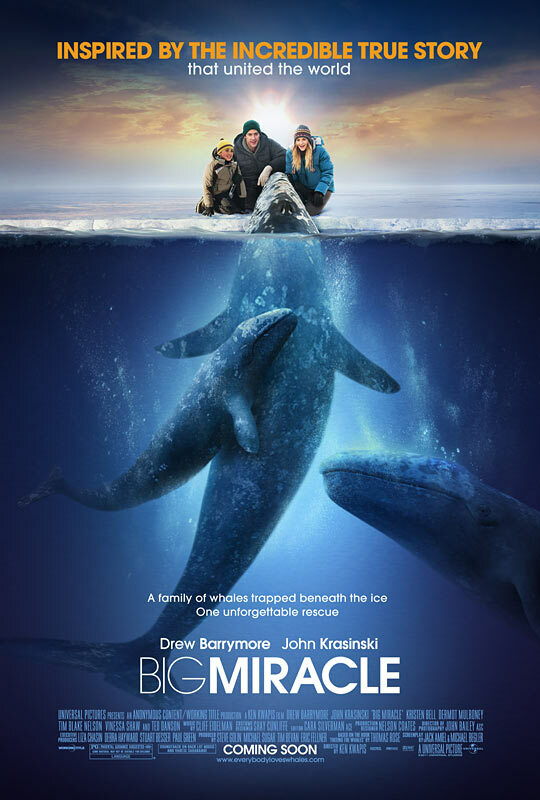 Inspired by the true story that captured the hearts of people across the world, the rescue adventure Big Miracle tells the amazing tale of a small town news reporter (John Krasinski) and a Greenpeace volunteer (Drew Barrymore) who are joined by rival world superpowers to save a family of majestic gray whales trapped by rapidly forming ice in the Arctic Circle. Local newsman Adam Carlson (Krasinski) can’t wait to escape the northern tip of Alaska for a bigger market. But just when the story of his career breaks, the world comes chasing it, too. With an oil tycoon, heads of state and hungry journalists descending upon the frigid outpost, the one who worries Adam the most is Rachel Kramer (Barrymore). Not only is she an outspoken environmentalist, she’s also his ex-girlfriend. With time running out, Rachel and Adam must rally an unlikely coalition of Inuit natives, oil companies and Russian and American military to set aside their differences and free the whales. As the world’s attention turns to the top of the globe, saving these endangered animals becomes a shared cause for nations entrenched against one another and leads to a momentary thaw in the Cold War. Screening is Saturday, January 28th at the Wehrenberg Galaxy 14 Cine (10am). BIG MIRACLE opens on February 3.